To pick up where we left off... 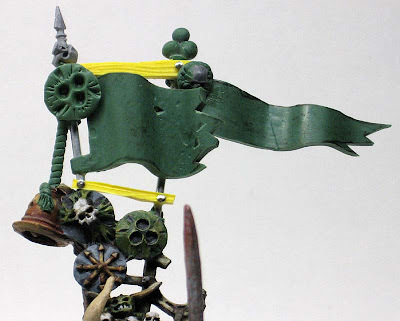 Here are the two greenstuff banners after they've had all night to cure and I washed them off. Remember they had cooking oil on them from the plastic so they didn't stick. Moving on to the next step, it was time to cut out the actual shape of each banner. I took one of the pens I usually use to line highlight my banners and drew out the basic shape on the blob of greenstuff. With a new blade, I carefully cut out the shape I was looking for. I left a little extra on the side that was going to be attached to the banner pole. 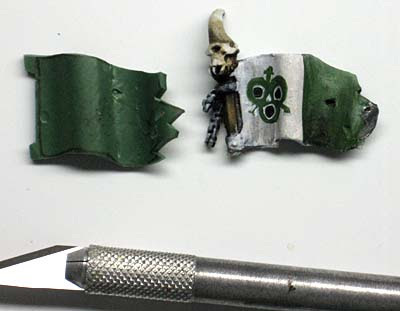 I also cut a few damage spots on the banner by taking the tip of my X-Acto blade and cutting out small chunks of greenstuff. Here's the basic assembly. The two new banner poles with trophies, the two cross bars and both banners in place. 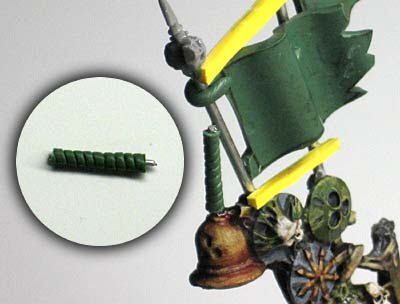 Remember that little bit bit of greenstuff rope? I trimmed down one end and left a small piece of wire sticking out. That little piece of wire was stuck into a pilot hole I made on top of the bell and the other end was glued to the side of the banner pole. 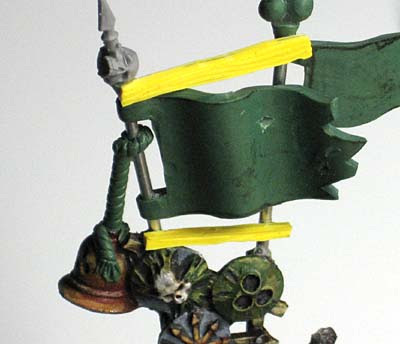 If you look at the top attachment point of the banner, you can see where I've started adding the little bit of greenstuff to make it look like the banner wraps around the banner pole. 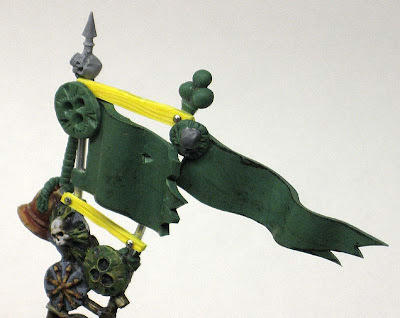 And here's what it looks like with a little more greenstuff added to the top and bottom of the rope holding the bell in place and both attachment points of the banner done. One last small detail was to add some small rivets to the two wooden cross members. You know, to make them look like they are nailed to the banner poles. I have a box of small pins that I picked up at Michael's craft store. I use a pair of wire snips and cut the heads off. 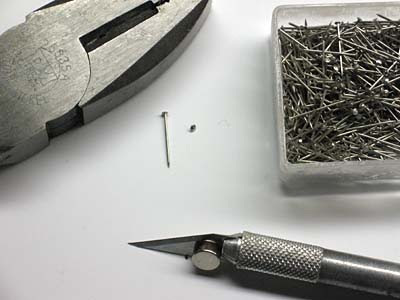 Putting them in place is fairly easy, I take my X-Acto a drill out a small hole with the tip of the blade where the pin is going to go and then use a small nail to add a drop of superglue to the hole. Trying to get the tiny pin head in place can be a challenge so I add a magnet to my X-Acto blade and then use the tip of the blade to pick up the pin head and carefully put it in place on the model. 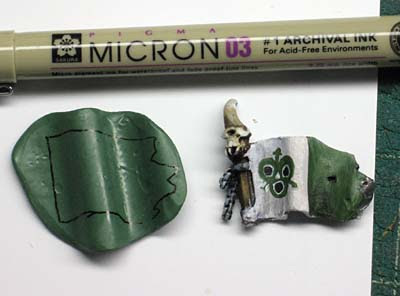 Once the superglue dries, I can pull my X-Acto blade away and the pin will stay set in place. And here are a couple pics of the finished model. You can see all the "extras" that were added as well. 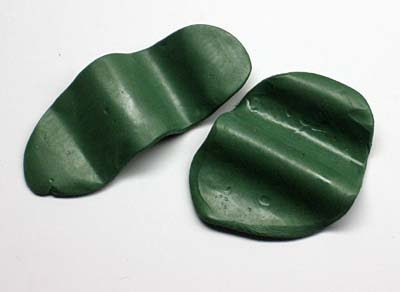 These were added in part for looks and in part for stability. You can click on either one of the pictures for a larger view. 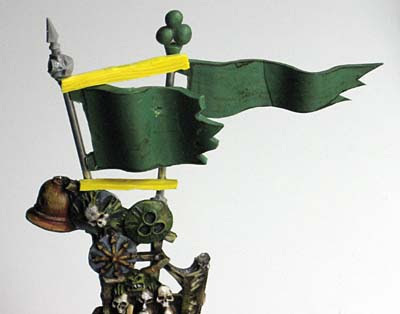 The banner that sticks out from the model can be bent without knocking over the model or breaking it off at it's attachment point. Hopefully this will be enough to help this model through some tough games. The banner is awesome looking. THanks for the guide. I may use it for all of my guard banners! Thanks guys, I have a Deathwing Company banner I might try this on in the coming months to see how it turns out.